2015 Bowman Football Hobby Box. Configuration: 10 packs per box. PRODUCT HIGHLIGHTS - Bowman Football features the first Topps Rookie Cards of the 2015 NFL Season, giving collectors their first opportunity to get officially licensed NFL trading cards! 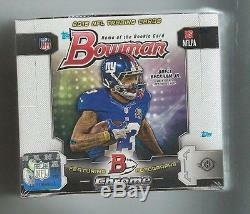 - Bowman Football showcases Chrome Refractor Rookie Autographs signed directly on-card! - The deep rookie checklist features 110 Rookie Base Cards and up to 80 Rookie Autograph subjects! - Each Hobby box guarantees 4 On-Card Rookie Autographs plus 1 Veteran Relic Card! PRODUCT DESCRIPTION AUTOGRAPH CARDS Rookie Chrome Refractor Autograph Cards (Up to 80 subjects): Features Hard-Signed Autographs from the upcoming 2015 NFL Rookie Class - Blue Refractor: Numbered. Red Wave Refractor: #'d to 25. X-Fractor: #'d to 10. Prism Refractor: #'d to 5. Printing Plates: #'d 1/1. Bowman Autographed Mini Cards (Up to 80 subjects): 2015 NFL Rookie subjects Hard-Sign vintage-style, mini-sized, 1948 Bowman Design Cards! - Red Ink Parallels: Signed in Red Ink #'d to 5. RELIC CARDS Bowman Relic Cards Featuring jersey swatches of top performing veterans - Blue Parallel: Numbered. Red Parallel: #'d 1/1. INSERTS BOWMAN MINI CARDS (Up To 110 subjects): Rookie subjects featured in the vintage 1948 Bowman Football design. 1 per Hobby Pack Bowman Die-Cut (Up to 50 subjects): The best veterans featured on an all-new foilboard, perimeter die-cut design. 3 per Hobby Box - Die-Cut Blue Parallel: numbered - Die-Cut Red Parallel: #'d 1/1. Die-Cut Autograph Parallel: (Up to 15 subjects) NEW! BASE CARDS Rookie Rainbow Foil Cards (Up to 110 subjects): These cards will feature a black-bordered design. 1 per Hobby Pack - Silver Ice Parallel: Limited. Green Bordered Parallel: #'d 1/1. Gridiron Ice Parallel: #'d 1/1. Rookie Paper Cards (Up to 110 subjects): White bordered paper parallel of Rookie Rainbow Foil cards. Black Bordered Parallel: 4 per pack Hobby Only! - Green Bordered Parallel: Numbered. Silver Bordered Parallel: Numbered 1/1. Veteran Paper Cards White bordered paper parallel of the Veteran Rainbow Foil cards. Black Bordered Parallel: 2 per pack Hobby Only! - Red Bordered Parallel: #'d to 25. Veteran Rainbow Foil Cards (Up to 110 subjects): These cards will feature a new, black-bordered design different from the Rookies. BONUS AUTOGRAPHED HITS UAAA GAME AUTOGRAPH CARDS (TBD subjects) These cards were produced and autographed at the 2012 Under Armour All-America Game. These Topps exclusive autograph cards will be included incremental hits! The item "2015 Bowman Football Factory Sealed Hobby Box In Stock" is in sale since Wednesday, June 17, 2015. This item is in the category "Sports Mem, Cards & Fan Shop\Cards\Football". The seller is "scsmkm" and is located in Dows, Iowa. This item can be shipped to United States, to Canada, to United Kingdom, DK, RO, SK, BG, CZ, FI, HU, LV, LT, MT, EE, to Australia, GR, PT, CY, SI, to Japan, to China, SE, KR, ID, to Taiwan, ZA, TH, to Belgium, to France, to Hong Kong, to Ireland, to Netherlands, PL, to Spain, to Italy, to Germany, to Austria, RU, IL, to Mexico, to New Zealand, PH, SG, to Switzerland, NO, SA, AE, QA, KW, BH, HR, MY, TR, BR, CL, CO, CR, DO, PA, TT, GT, SV, HN, JM.